The twenty-one precepts of The Way to Happiness may be likened to the edges of a road. For those who know where those edges lie, that road becomes a smooth and fast highway. To plainly mark those edges, the 95 pages of the booklet offer a full explanation of each precept and its application in everyday life. 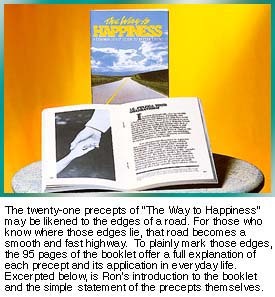 Excerpted below, is Rons introduction to the booklet and the simple statement of the precepts themselves. rue joy and happiness are valuable. Any individual or group seeks to obtain from life what pleasure and freedom from pain that he or they can. I am sure you can think of instances of this actually happening. Such wrongs reduce ones survival and impair ones happiness.